Toronto, ON (Mar. 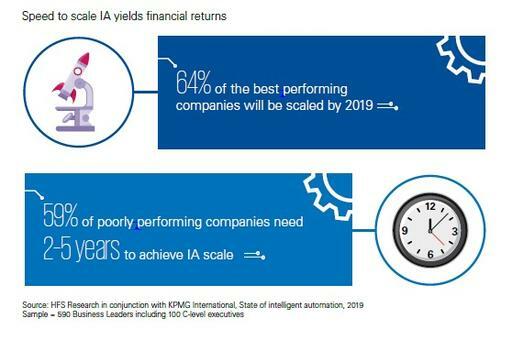 28, 2019) – According to KPMG International’s new global survey, Easing the pressure points: The State of Intelligent Automation, enterprises are not scaling Intelligent Automation (IA) technologies – artificial intelligence (AI), advanced analytics, and robotic process automation (RPA) – fast enough to meet desired objectives and returns. However, those organizations that are scaling IA technologies are seeing strong financial performance. 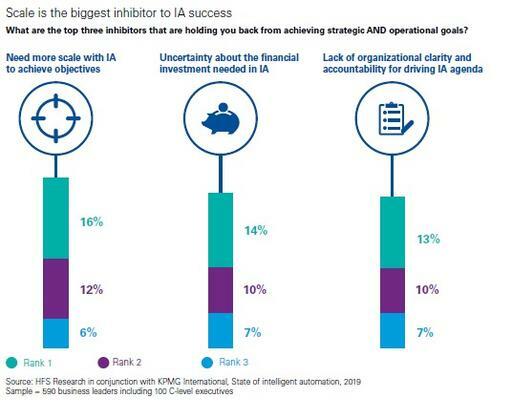 When will your adoption of Intelligent Automation (IA) be scaled-up and industrialized? What is your organization’s topline and bottom-line performance? What are the top three inhibitors that are holding you back from achieving strategic AND operational goals? KPMG LLP is the independent U.S. member firm of KPMG International Cooperative (“KPMG International”). Learn more at www.kpmg.com/us. KPMG is a global network of professional services firms providing Audit, Tax and Advisory services. We operate in 153 countries and territories and have 207,000 people working in member firms around the world. The independent member firms of the KPMG network are affiliated with KPMG International Cooperative (“KPMG International”), a Swiss entity. Each KPMG firm is a legally distinct and separate entity and describes itself as such. For more information, visit kpmg.ca.